The Gartersnakes, and other live-bearing, harmless snakes, which were included within the Family Colubridae, have recently been placed in the Family Natricidae. The subspecies in Canada (Thamnophis elegans vagrans), also called the Wandering Gartersnake, can reach just over a metre in total length. It is quite variable in colour but usually has a distinct pale yellow or brown stripe down the back. The side stripes are the same colour as the back stripe and occupy the second and third scale rows. The background colour is brown, grey or green with darker spots between the stripes. The Terrestrial Gartersnake is distinguished from other Gartersnakes by the eight scales on its upper lip, two of which are enlarged. Similar snakes found on the prairies are subspecies of the Common Gartersnake and the Plains Gartersnake. The Plains Gartersnake has its side stripes on the third and fourth scale rows and these are paler than the back stripe. Although the subspecies of the Common Gartersnake also have the side stripes on the second and third scale rows there only seven scales on the upper lip. The subspecies of Common Gartersnake found on the prairies is the Red-sided Gartersnake which has red or orange bars between the back and side stripes. The subspecies of the Common Gartersnake found in British Columbia, (Valley Gartersnake and the Puget Sound Gartersnake) either have red or black on the top of the head. The Northwestern Gartersnake has only seven scales on the upper lip and has a more distinct brightly coloured back stripe. 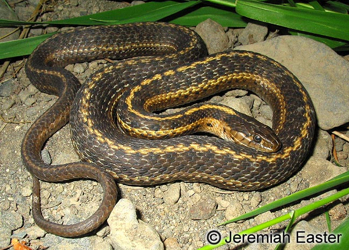 The Terrestrial Gartersnake is widely distributed in southern British Columbia, Alberta and southwestern Saskatchewan. Its range extends south to New Mexico. This species is often found near streams, lakes, ponds and marshes but may also be found some distance from water. Like other Gartersnakes this species bears live young rather than eggs. From 4-19 young may be born in a litter in mid to late summer. The Terrestrial Gartersnake eats a variety of invertebrate and vertebrate prey captured both in the water and on land. Large numbers may hibernate together in mammal burrows or natural crevices and be found together on emergence in the spring. It is sometimes seen basking in the morning and will take to water when disturbed. This species is considered secure in Canada.